There is always something a bit unworldy about an island, a sense of being removed from the mainstream of life, even if only by 3 km of water, and so it is with Matiu/Somes Island in Wellington Harbour. In 1872 the Wellington Independent newspaper noted that the island was bare apart from "3 native palms on the east-side and ferns, toetoe and a species of cotton in a ravine near the lighthouse on the south-end"? Dr Max Bruchner, a migrant on the out of Bremen in 1878, published an account of his voyage in Breslaw and said much the same thing. Given this how can the presence of 54 species of fungi, observed over a period of 23 years, be explained? A close look at the island's history gives many clues. From earliest days, in about the First half of the 14th century after Kupe found and named the island, various tribes fled to it in times of intertribal strife, built two fortified villages, developed kumara patches and gathered shellfish, birds, fish and edible roots. It wasn't continuously occupied because of a water shortage, and there are no records of the island's vegetation. About 1820, whalers and sealers arrived, and the 1840s brought European settlers. Matiu Island was recognised as a convenient place to off-load those carrying exotic diseases to either die and be buried there or be released when proven healthy. Settlers were fumigated in a brick smokehouse and their clothes and bedding burnt on the beach. Accommodation had to be built to house them. Healthy people were sent to the northern part of the island and the sick people to the southern. Locally sourced materials were used as well as imported ones. One wonders what fungal spores arrived on shoes, clothing, timbers etc. For a short time in the 1840s and before the last world war, picnickers sometimes visited, as the island was a protected habitat of birds and lizards. Primeval forest had long gone but there were a few pockets of shrubs grown from the old seedbed, and seeds brought by birds and wind. In 1872 the island was reserved to the Queen as a Quarantine Station. Subsequently, its tradition of exclusivity was perpetuated when it was used as an animal and bird quarantine station and as a prisoner of war camp in the two world wars. By 1877 Australian eucalyptus and English firs had been planted, maybe by lighthouse keepers, for shelter and firewood and the commonest plants were toetoe (Cortaderia sp.) and flax (Phormium tenax); two cabbage trees (Cordyline australis) grew in a cleft, and ferns were seen only on the island’s shady side. There were a few wild cats, many rats and two goats, but no sheep were allowed at first, lest their wool would carry infection to the town. One hundred years later, some Department of Agriculture staff and Forest & Bird Society members, mainly from Lower Hutt, began to augment the patches of vegetation which straggled around the fringes of the island. The largest was a pocket of karaka (Corynocarpus laevigatus), ngaio (Myoporum laetum), karo (Pittosporum crassifolium), pohutakawa (Metrosideros excelsa) and prominent pines above the wharf, flaxes survived well in even the windiest spots. Tree daisies (Olearia sp. ), taupata (Coprosma repens), pohuehue (Muehlenbeckia sp. ), a few puriri (Vitex lucens), native kotukutuku Fuchsia excorticata and even a whau (Entelea arborescens) began to be joined by thousands of trees endemic to the area. The last hillside to be planted has been reclaimed, and non-endemic species are being removed. It would be interesting to know what types of mycorrhizae lurk in the soils. The various Pinus species proved treasure troves, as they are very old. The mycorrhizae seemed to spread for metres. In the grass amongst their roots are red and white Amanita muscaria (exotic) and big fleshy brown capped Lepista nuda (exotic) with bright purple gills and white-purple flushed stipes. In the rich soils of the areas where the lighthouse keepers and quarantine workers kept flocks of sheep, the edible Agaricus campestris, Macrolepiota and Lycoperdon sp. are found. On one ancient storm-wracked Pinus macrocarpa were two prized specimens of Tyromyces setiger with bristly upper surface and distinctive blue-white tints. Other conifers held the shelf fungus Phellinus wahlbergii, bright orange Pycnoporus coccineus, the ruffled fan-shaped and stiped brown, orange, grey and green Trametes versicolor, and the hairy Trametes hirsuta. Fallen and decaying branches and twigs of karaka, pohutakawa, ngaio, karo, puriri and manuka (Leptospermum scoparium) are difficult to identify but held many fungi. 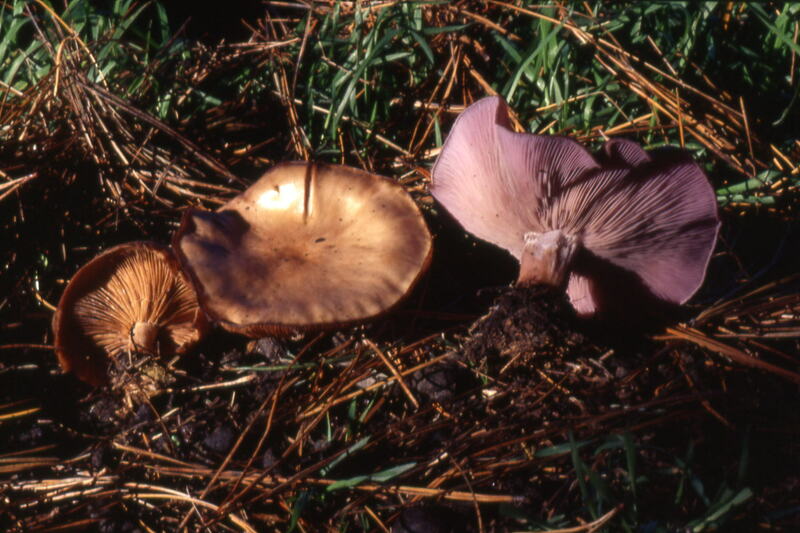 There are delicate cream, kidney-shaped Crepidotus mollis and C. variabilis; thick brown ear-like Auricularia cornea, and droves of radially grooved bell-like Coprinus disseminatus which change colour from cream to grey and have a striking yellow apex. 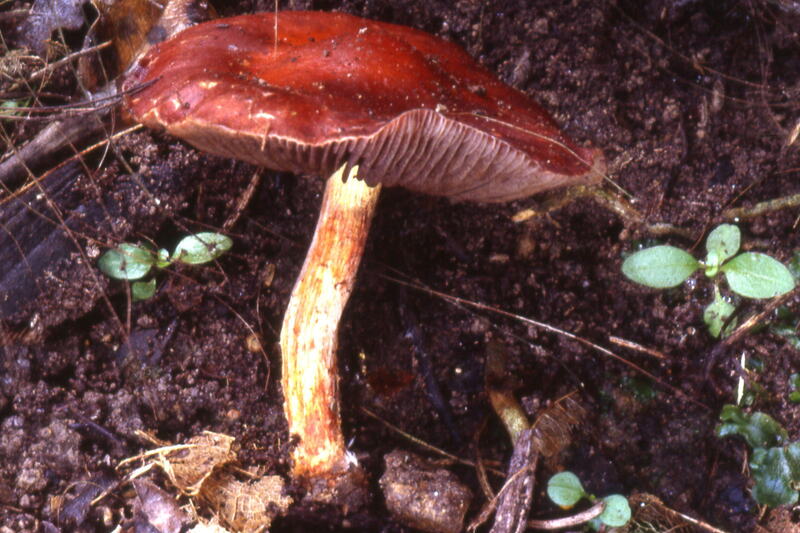 As logs fall and decay, they have a succession of colonizers, groups of orange-brown, pointy-capped Galerina sp. 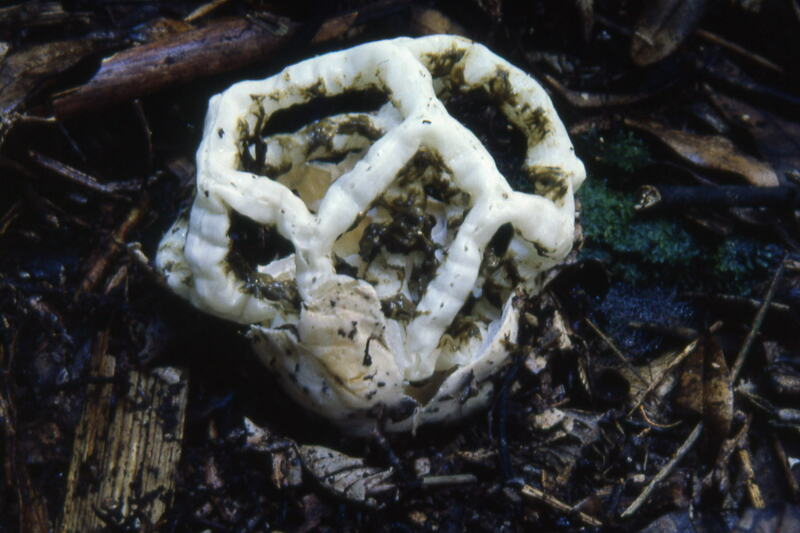 one year, the next invariably a velvety net-patterned Pluteus velutinoratus and later the black, white spore tipped "Dead men's fingers" of Xylaria hypoxylon. On manuka/kanuka wood, the fresh pink splotches with white woolly margins of Aleurodiscus ochraceoflavus are seen just before complete disintegration of the branches. 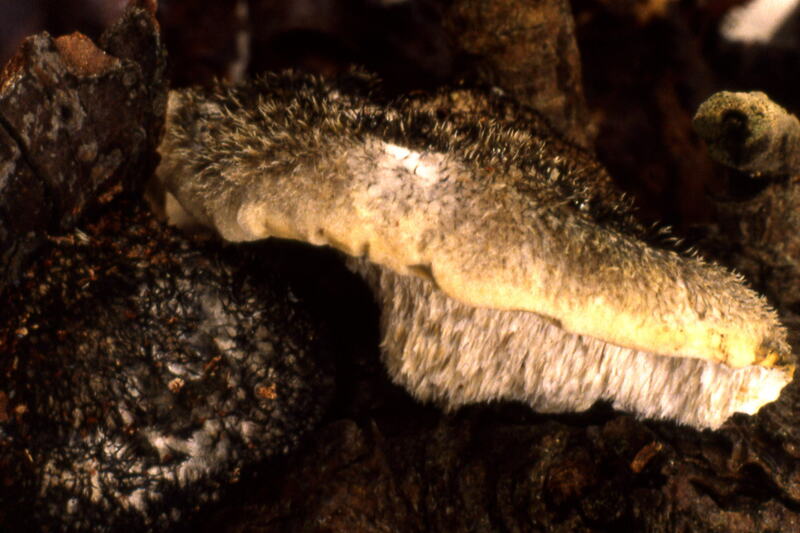 Cut ends of logs are the preferred habitat of the tiny, jelly-like fingers of Dacrymyces stillatus, and on the old roots are often large, bright orange specimens of Gymnopilus junonius with caps up to 15cm diameter and wide rings on their stems. Wound sites on old ngaio trees held Marasmius sp. 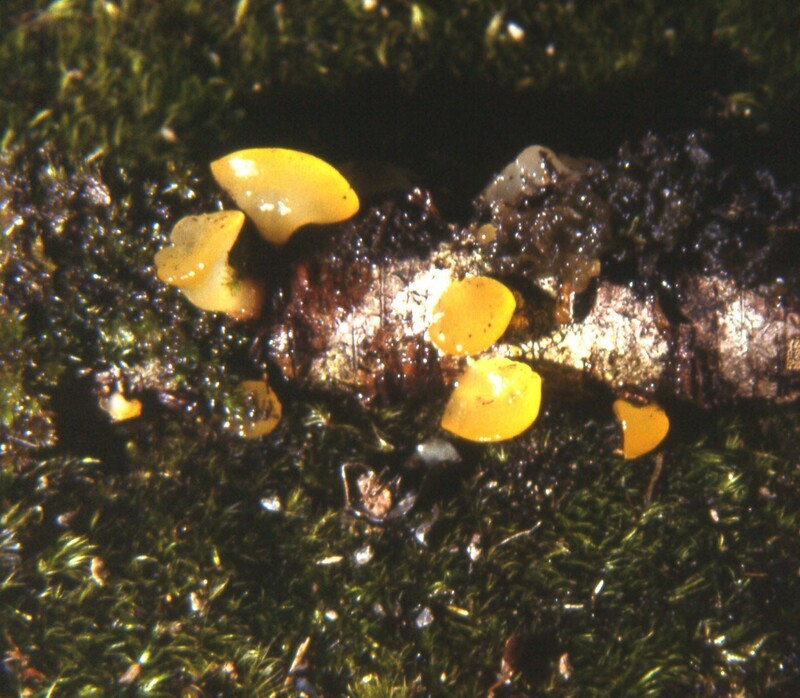 and about 10 years ago, fallen branches began to be coated with drifts of Favolaschia calocera, an orange fungus with little holes on the underside. 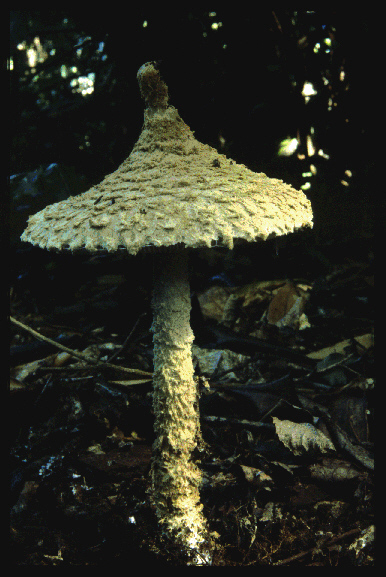 This fungus is thought to have been introduced from Madagascar. It first appeared in New Zealand about 1970 and is now widespread. It is always a pleasure to find twigs with bird’s nest fungi (Cyathus novae-zeelandiae) with its little round cups filled with egg-shaped spores, ready to be splashed out by a drop of rain. The distinctive brown circular caps of Polyporus arcularius made their trip to the island on a sheet of plywood used in the nursery where indigenous plants are propagated, and bright red Stropharia aurantiaca grow happily in the sawdust between the rows. 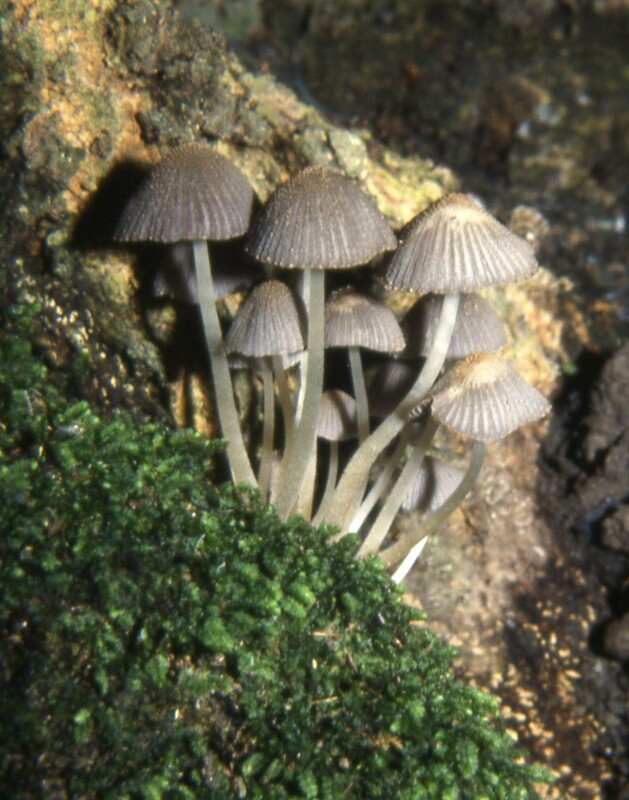 In the soil and potting mix in the plant pots, Inocybe sp. flourish and over the past three years have been making their way down zigzag paths beneath the nursery. 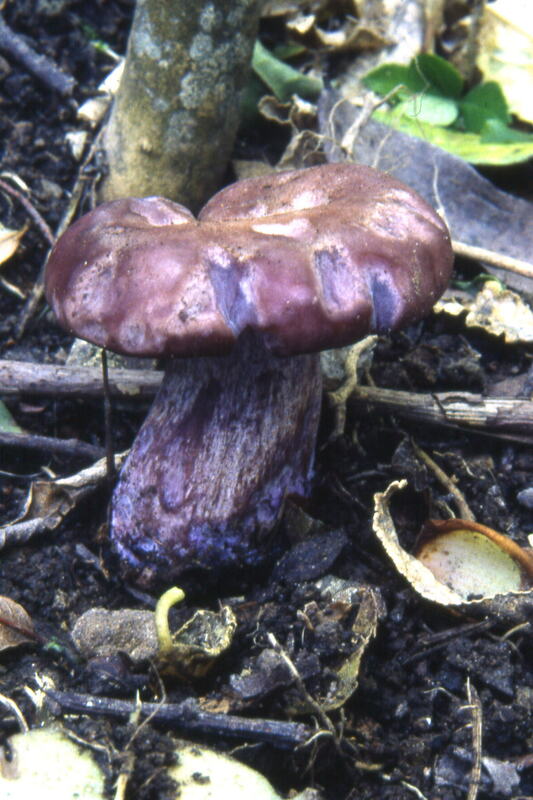 Leaf litter is always a rich source of fungi and Matiu Island had Paurocotylis pila, Lyophyllum decastes, the ubiquitous Laccaria laccata and the lacey basket-like Ileodictyon cibarius with its odorous spore-filled gleba. By far the most exciting find was a yet unnamed Amanita with its pointed cap and stipe thickly covered with felty grey scales, previously thought to be a rare sub-tropical species. How did it get to Matiu/Somes Island?